According to Adam Sandler, it’s already hard enough going through life just being yourself. Yet having to turn into all sorts of other characters additionally in Tom McCarthy’s The Cobbler was actually a breeze, as he explained during this funny sitdown for the movie. However, when his screen dad Dustin Hoffman may or may not have turned into him, well, somewhat of an identity crisis for Sandler did sort of kick in. Other topics on the table touched on annoying bright lights, bad landlords, soup, plastic coated couches, and a pretty much guilty as charged confession related to dislocating Method Man’s thumbs during filming. 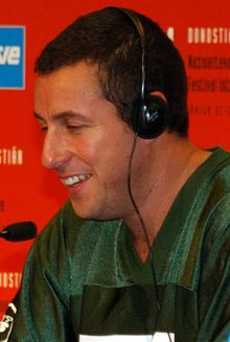 ADAM SANDLER: Aha! The lights in here, I’ll tell ya. C’mon! Turns these lights down. It’s too much! Okay, so you inhabit lots of other people’s bodies in this movie, after putting their shoes on. So what did that experience feel like? Well, what was it like when Dustin Hoffman turned into you, and then you back into yourself all over again? And now that you experienced turning into other people in this movie, is there anyone in real life you’d like to turn into, if you could? AS: Just the pleasure she has of making me soup! Yeah, just to see that from the other side. And putting on the vaporizer for me, when I’m sick! And how nice that must be. For her! This is a movie about bad landlords, so do you have any bad landlord stories of your own? AS: Ha! When my landlord would say pay up, I’d say my wife, she’s got it! Uh, nah. I don’t have any bad landlord stories. Your character Max is pretty unhappy, so what advice would you give him to cheer up? AS: How would I cheer up my character and tell him everything is gonna be alright? Um, I don’t know. I like his life. And I like that he’s good at what he does. I can’t cobble as well as that guy! I tried! But you know, he’s got a loving mom. AS: Yeah. That happens! But he’s got the house. And he’s got the bills! Yeah. That Mom didn’t pay! But um, I just think the best thing he’s got going for him, is…the plastic on the couch! And knowing that he doesn’t have to clean up. Even if he spills! Yeah, that’s right. Nah, I’d just tell him everything gonna be alright, Max. Believe me. You’re a handsome man with a beard. Enjoy it! So now that you’ve played a cobbler, do you think shoes say something important about people? Not sneakers, but real shoes. AS: Uh…I don’t wear shoes a lot! When I do, I feel more like…my vocabulary goes up! And I feel more like my father, and like I’m worthy of having children. And when I’m wearing sneakers and my kids ask me a question, I say – ask your mother! Well, when was the last time you wore real shoes? AS: Uh, I am wearing shoes to the Saturday Night Live thing. AS: Because, uh…I rented a tux! Oh no, I bought a tux. Wait no, they gave me a tux! And they gave me shoes too. That was the first thing I asked, will you give me shoes too? Because I don’t have any good shoes! Yeah, I got some nice tux shoes, everybody! I’m all sneakers. But yeah, we’re gonna be in the room with everybody. It’s gonna be neat. And the best part will be bringing us all drinks! Well on the heels of that question – no pun! – do you ever get custom made shoes from a cobbler in real life? AS: I have custom othotrics! And those are good. They work well! But I have a question for you. After you wore a pair of sneakers when you were a kid, when were you allowed to get the next pair? AS: Like my parents would be nope, not yet. Maybe once a year – because your feet are growing. My parents would be like, no – you’re good! What was the coolest part for you about this very cool cast? AS: Ellen made us laugh. Every other word was, “f” this, and “f” that! But I loved it. And Buscemi was surprisingly not funny, to be honest! He was an energy drainer! Yeah. Well, you got such a great cast together, like Method Man. AS: I didn’t want Method Man! Or Cliff – that piece of crap reporter on that show! Nah, it was Tommy doing that. Is it true that Method Man dislocated both his thumbs, trying to grab your foot with the shoe on it? AS: That’s right! Alright! Yep. And I massaged him back to normal! Three days, it took me! But it was fun. That was a good fight we had! How do you feel about seeing yourself now so much tinier, with the small screen and computer and gadget evolutions? AS: Right. Um, I’m just excited for people to see this movie. And I did see this movie in Toronto at the festival, on the big screen. And there were a lot of people in the room, and it was neat. Because it played a lot like a comedy. You know, there were a lot of laughs. And it’s always fun when you’re in a theater, hearing everyone laughing together. And people just on the same wave length, and having a great time. And this movie is coming out in some theaters! Which will be cool. But the fact that you can see it at home and get it, that’s great. You know, you work hard, and you make the best movie you can make. And you’re making it for as many people to see as possible. And I think that’s nice. But I never want movie theaters to go away. They’re just the greatest time on the town. You go out, and it’s a great place to go. And a great place to hang, and be with friends. But as an actor who works hard at making movies, I am glad that there are things that, no matter what, people can see the movie. You know? It’s hard to keeep a movie in a theater for a long time, there are so many movies. So when you leave a theater, you’re just glad that there’s a light on your movie. Or something like that! What does SNL mean to you, and to be on it? AS: I guess it affected me, and as a kid. It was the thing you talked about with the kids in the playground, and what was funny on the show. And everything about the show rocked you. Because your parents, they were just cool enough that your parents weren’t sure if you should be watching it. Then they’d be excited to get in there. And you had to stay up late for it, so that was a big deal. And just over the years it was um, it’s there. It’s there. And it’s comforting, it’s exciting every time. And you know what’s happening live. And it’s just an amazing thing. Forty years worth of um…meaning something. You know? What was it like shooting The Cobbler in a NY neighborhood? AS: The Lower East Side was a great place to shoot. A lot of my family is from the Lower East Side. And uh, just good food. And nice people. And that brought back a lot of memories for me. And just driving around NY, and hanging around with my parents. And just talking about Grandma, and that kinda thing. What movie do you think would make a great double feature with this one? AS: Of course, a classic. Like Caligula! Let’s not forget that one. Yeah. Would you say you’ve been in a few classics yourself? AS: That’s right. But I don’t want to talk about it! I don’t want to juice them up! But thank you for saying that. But if you want to make a classic, it helps to have Buscemi in the movie! And my mother always says to me – I swear to God! – when I’m making a new movie she says, oh. Is Steve Buscemi in it! And I’m like, oh yeah, yeah. And she says oh, it’ll be a good one! I swear to God, she says it every time! And if I say Steve’s not in it, she says oh – You should ask him! Now about part of this movie in Yiddish, was that your idea? AS: No, that was the Tommy’s idea. But wait, McCarthy isn’t Jewish, he’s Irish! AS: I know! But it was totally his idea. Yep. Any last word that you have today about anything?